I've been gone from New York for over a month now and some of my essential beauty products are running out. So to be efficient :) I'm ordering these products online now so they'll be there when I get back on Friday :) I feel like I have so many things to do when I get back so this will be a thing off my to-do list! Want to share these products with you as these are the ones that remain staples in my collection - and they're just fab! I put this product into a spray bottle, and use it between deep-cleaning my brushes (which I do with a moisturizing anti-bacterial hand soap). I'm really OCC about clean brushes, so I always spot clean with this spray before I do my makeup. This is my HG (holy grail) moisturizer! I've been using it for the past few months and it's so kind to sensitive skin and just feels like heaven. If I'm going to be out in the sun, I add SPF to it and during these colder months I've been adding a few drops of Argan oil for extra hydration. I will definitely keep repurchasing this moisturizer, love. This is 100% pure argan (Moroccan) oil, and although it's more pricey than the kind I use to buy on eBay - the quality is a lot better. This oil is fabulous for your hair and skin. As mentioned above, I add one to two drops to my moisturizer, apply it under my brows and a tiny bit under my eyes, I also use it in my hair and apply it to any part of my body that needs extra love. A little goes a long way. I've been enjoying this primer, and I love that it smooths my face before applying makeup and that it hasn't broken me out. I only use this on days when I need my makeup to last for a long time, as you don't want to be applying unnecessary products to your skin. It does a good job keeping my makeup in place and although I still need to touch up my T-zone now and then, I do it a lot less when the primer is on. This is another HG product of mine. Love love love! I've tried a ton of foundations, and this is in the top 3. I apply it using my Real Techniques buffing brush which is fab - definitely worth getting! The super fine brush gives me so much precision and control unlike any other. Mine has been finished for the past 3 weeks, and Urban Decay isn't available here (along with a whole list of other brands - to all my international readers, I understand your frustration lol). I tried two others, and it just doesn't come out the same. Can't wait to get another one and doll up my eyes again! This product is great for getting rid of the powdery look from your face after applying your makeup. It also does a great job of keeping my makeup on for longer, which means less touch ups. I've also heard of people applying this before applying makeup, so it could act as a primer as well. Argan oil is definitely one of my essentials as well. I never tried that Makeup forever foundation, but I hear a lot of good stories about it. At the moment, my essential is the falsies mascara by maybelline. I have never been into putting mascara on until I bought that mascara. One of my must haves is definitely the MakeUp Forever HD foundation! I love this foundation I have been using this for almost going on 3 years :) !!! I am in 127# ! Thats my only HG (Holy Grail) right now. I just purchased the Skindinavia setting spray!! Im so excited to use it!! I also want to try out the Josie Maran Argan Oil! I hear so many great things about it! could you please add a link of where to buy these products as well as their price? 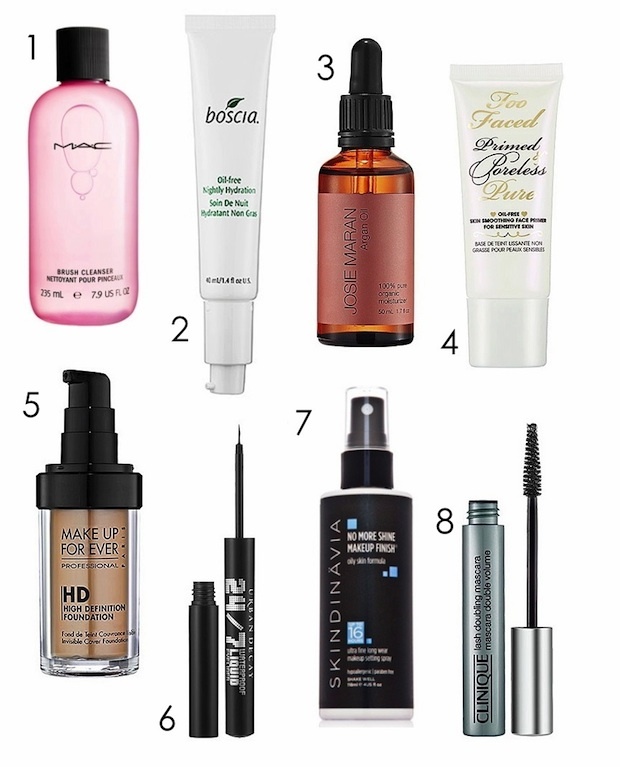 I'm interested in that clinique mascara :-) great post! I am so happy you're back!! Hello Annie!! So happy you're back :) I am looking for a nice liquid liner, but I am not very good at putting it on, so since you mentioned it has easy application, I want to buy it. But I don't want water proof. Does 24/7 mean water proof? Thanks! I really want to try the HD foundation as it looks amazing and I've heard such great things! I'm unsure as to where to buy it from though so it might be nice to read links alongside your products on here? I'm not really a big fan of the Argan Oil although I know so many people love it! Oil just doesn't appeal to me for some strange reason! Have you used any of the other Skindinavia Setting Spray's? (the original/ the moisture lock) etc? I have combo skin, sometimes dry, sometimes really shiny with makeup. Wondering which one would be the best to use? I'm going through my first sample of the Clinque mascara, and I completely agree with you! It is one amazing mascara, especially layered on top of another not as good one. All of these products sound great and I want to try them all! Oh my god I love the Argan oill! I'm really into headwraps lately so I'm definitely going to purchase some like right now. But product wise? The Argan Oil!